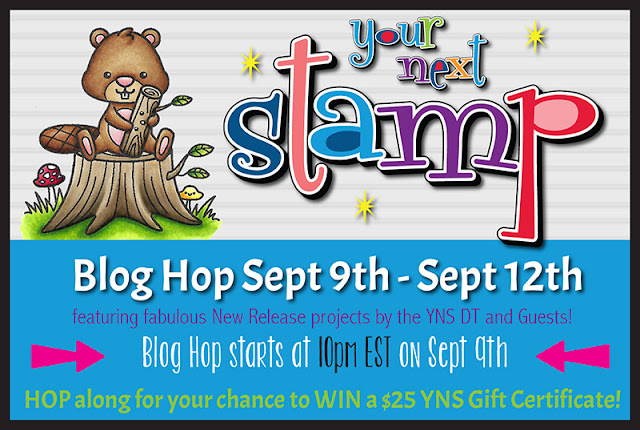 Hollybeary Creations : YNS September Sneak Peek!! Happy Saturday everyone... Are you ready for a peek at the September Release from Your Next Stamp? Head over to the blog when you leave here for a peek at some more great projects from the team and a look at what's coming tonight at 10pm EST to the Shop!! I'm sharing a peek at the Super cute new set Oh La La... How cute are Macaroons? I created a Distress Ink background on some Watercolor paper with Salty Ocean Distress Oxide Ink. Then I die cut the panel using the Stitched Rectangle Die set. I adhered the panel to a Yellow A2 Size card base and stamped the sentiment in the upper center area. Then I stamped the Macaroons onto some Bristol Card stock using Archival Black ink and I colored them in with Zig Clean Color Real Brush Markers and a water-brush. Once they were dry I used the coordinating dies to cut them out and adhered them to the card front with some foam tape. For a touch of sparkle, I added some Nuvo Drops in White Blizzard on parts of the images. I wanted a little extra pop of Yellow so I added some Nautical Matte Gumdrops. Head over to the YNS blog for a complete list of the Design Team blogs for more sneaks!! Be sure to join us at 10pm EST tonight for the New Release Blog Hop and Full Reveal!!! Too cute! Love the inking on the background! yummy card. i love seeing all the different sneak peeks in this hop. So adorable ! I love the smooched background.